It would be accurate but misleading to say that the Russlander tells the tale of a Mennonite community living in Russia that had to flee to Canada during the immediate aftermath of the Bolchevik revolution. The importance of Sandra Birdsell's book is that using the case of her own community she is able to illustrate what happened to many ethnic minorities living in Russia when the Tsarist system was overthrown. Even importantly it describes what happens wherever there are religious and linguist minorities governed by special rules when the regime they live under is overthrown by a group with leveller instincts.Imperial Russia was comprised of hundreds of different linguistic communities belonging to a multitude of religions and sects. Some of the minorities were in Russia by virtue of conquest notably in central Europe and the trans-caucus. The Mennonites were in Russia by invitation as the Tsar was afflicted by the great problem of having too much territory and not nearly enough citizens to tax. Thus the Mennonites were offered the right to live in Russia on the mere condition that they farm industriously. They were allowed to use their own language and practice their own Anabaptist form of Christianity. They were not required to do military service and were exempt from serfdom. Because they were prosperous and lived under different rules than the Russian peasants around them they attracted jealously.The Russlander then describes how a Mennonite community failed to understand the peril that their special status placed them in. When the Tsar fell, they found out soon enough. Properties were burned and families were massacred. We see all these events through the eyes of a young girl who is lucky enough to survive and move to Manitoba with other Russlanders (i.e. Mennonites Resident in Russian territory).This is a truly great book whose importance greatly surpasses that of its nominal subject of how the Russlanders came to live in Manitoba. Read this book. In many ways it is also about the Yazidis of Kurdistan who are currently being threatened by ISIS. Many books grab your attention right from the beginning, but dip in the middle after you're invested, finally picking up again at the end to finish on a relatively high note. This is not one of them. This book was just OK at the beginning, then began to build and build some more. My impression of the first 100 or so pages is that the author was telling her own family history. In doing so, the main character, Katya, was probably her grandmother. I think it is hard to think of our grandparents - even parents - as children, to think we can know them as such. I felt the author was having a hard time breathing life into the character of Katya. At some point, though, Birdsell was able to cross that line between family history and living character. The other characters were believable, but not quite three dimensional.The Goodreads description which includes But in the wake of the First World War, the tensions engulfing the country begin to intrude on the community, leading to an unspeakable act of violence would have you believe that the reader is totally unaware of this unspeakable act of violence. I have to correct that impression as page one is a brief newspaper account telling us of it. However, it is just a newspaper account and, even though is horrific, we do not feel the full impact until later. There is little of the war in this. The story becomes not just post war, but the immediate aftermath of the Russian revolution. In the countryside, anarchists prevailed. Bands of people entered houses without permission and "rummaged," taking what they wished. The people were more than just hungry - bread was supplemented with clay flour and vegetable scrapings. Having gotten a response from a relative in Canada, one remarks "They don't know hardship. Here, if we were fortunate enough to own a cow, we'd have to pay the government eleven million rubles in tax, eighty million for a horse." I might have given this just a high 3 stars had it continued on the plane of the beginning. But it didn't. Still, I cannot claim it is a 5-star read and will settle for 4-stars, perhaps slightly above the middle of that range. I was really looking forward to this book but I was rather disappointed by it. The story is very good but I had a hard time getting into the book because of the way it is written. I think it's a shame; it could have been so much better! I very much enjoyed this novel. I am not a huge reader of historical fiction, but found the characters and plot compelling, and the historical aspects of the novel rang true to my limited knowledge. I have great admiration for Sandra Birdsell's ability to craft both setting and plot to create a wonderful novel that I would highly recommend. There is an aspect of mystery that keeps the story moving along even for other readers, like me, who do not normally choose this particular genre as their first choice. I have now read this book through twice with several years in between readings and I have to say... one of the best books I've ever read. Much of that is due to the fact that the book chronicles the events of a typical Mennonite family living in Russia during this time period. Eventhough most of my family had already left for Canada at this time, I still enjoyed reading about the lifestyle my ancestors would have been living had they never left.I learned a great deal about the traditions, relationships, social institutions and the wealth of Mennonite farmers during those days. And though it was hard to read, I took great interest in the slaughter of the family by the peasants as it struck at the heart of the deep-seeded and ugly roots of poverty at that particular time and place in history. I highly recommend reading this book for all Mennonites. And for those who are not... read it and learn something about a peace-loving people who are willing to die for their beliefs. A stellar, solidly and poignantly told, historical narrative of the Mennonites who lived in Russia at the turn of the century. As I occasionally teach English at a Mennonite university, I like to teach at least one Mennonite novel -- this was a most excellent choice for me, and hopefully for my class. Reading this book was somewhat like gazing at a beautiful still life in a fancy art museum. Beautiful to look at but ultimately boring and you move on. This is how I feel about this book. There were many good things but, in the final analysis, I felt like I was gazing upon Katya's life rather than being immersed in it.Many parts of the book were very interesting. I had no idea that there were ever Mennonites living in Russia (actually, I believe to be technical, they were living in Ukraine)and it was interesting to read about the Mennonites in general and also how they fared under the Tsars and then the Communists.Much of the writing was lovely, the descriptions of the land and the seasons, how people change but the land endures. But the book was just way too long. Too many pages gazing at the painting and not feeling it.Also, as other reviewers pointed out, there were too many minor characters that were really unnecessary to the story. Fine if they made a brief appearance but the author went on way too long about some of them. For example, there was an elderly spinster boarding with a neighboring family. I believe they called her Tante Anna. Pages were devoted to Tante Anna, how much the students loved her, how her room always had a strange odor (which turned out to be spoiling cheese hidden in the pockets of her clothes), taking her to the railroad station, finding the cheese, making the station smell. What was the point? I didn't much care about Tante or her cheese.Final analysis, I would give this book 3.5 stars. This was a difficult book for me to read, but I kept at it for two reasons.One is that my friend Janet Armstrong recommended it and she has good taste in books - better than me. Secondly almost everyone on here who reviewed it LOVED it.I just found it so slow that it was difficult to keep my interest. Then I realized why.My hope was that the book would stop being in Russia and would show the immigration to Canada - specifically Saskatchewan and Manitoba. I had hoped to find out more of the history about that part of Katys's life. I therefore thought that the writing should move "faster" so the Canadian part could begin. When I realized that there was not going to be any Canadian sections I was able to let go of those expectations and read the book the way it was meant to be read. But could only give it a 3. An excellent, moving story of the Mennonite people In Russia (now Ukraine) at the time of the revolution. With many friends and relatives of Mennonite antecedents, and having visited villages in the former Molochna and Chortitza Colonies in Ukraine, the book had special meaning for me. I recommend it for anyone interested in Mennonite history or in just a good read about good people in difficult times. How can you not like a book where everyone gets slaughtered?! Actually this was not as painful to read as I anticipated - the story was gripping and the historical and cultural aspects were fascinating. It will be really interesting to contrast the Mennonites of this book with those in the next book I'm reading - A Complicated Kindness by Miriam Toews. I absolutely loved this story of a Russian Mennonite family and the events that precipitated their migration to Canada, but perhaps that is largely because it could very well have been the story of my own grandparents. Katya Vogt is an old woman in Winnipeg when she is asked to tell the story of her immigration to Canada to a young man who is recording the oral histories of elderly Mennonites. The tale she tells is one of violence and terror, as the quiet estate farm she grew up on is destroyed by angry peasants and the various factions fighting for control during the Russian Revolution. In Russia at the invitation of the tsar, the Mennonites invoked the wrath of the local peasantry who were jealous of the special privileges granted to them, and their relative success and wealth. Although this story takes place in a different part of Russia than where my family lived, I suspect the experiences were similar. My grandparents, like most of the Mennonite immigrants, did not talk much of the revolution and its aftermath. I have heard a few stories from elderly aunts and uncles who were young children during the difficult years following the revolution, prior to my family's emigration in 1927, but books like this are the best source of information that I have as those relatives are now long gone. This was an interesting look at the Mennonite way of life and the structure and traditions of the communities in Russia. The story starts a bit slow and seems a bit vague, as the narrator was a young child at the beginning of the story, and her understanding of events not always accurate, and her memories not always complete. As she matures, the story becomes more clear and her perspective more mature. Occasionally, a few letters are cleverly included to enhance our understanding. It gave me a new understanding of my grandparents and many of the older Mennonites I have known. This is definitely not a feel good story, and we know the ending will not be happily ever after, but it is the story of the resilience of a people who managed to survive and forge a new life in yet another new land in their long history of migration. 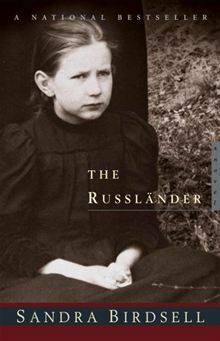 In _The Russländer_, Sandra Birdsell gracefully and stunningly evokes a time and place that would be otherwise foreign to most modern readers. This is one of the best novels I have read in a long time.As other reviewers have noted, the book is difficult to read in several regards. While the first half of the book has a slower pace, it is because the author is trying to establish a cohesive sense of setting and characters--not easy to do given the unique and largely untold story of Mennonite colonies in Revolution-era Russia. I would advise readers in the first few chapters to really pay attention to characters' names and relationships. The author tends to sort of plop you down in the middle of the action and expect the reader to pick up on all the connections on their own. I wasn't paying much attention to the names (many of which are similar/ alliterative: Abram, Auguste; Dietrich, David) early on and that caused a frustrating sense of disorientation later in the book. All in all, though, the extra effort is worth it. Among other things, it provides a stunning portrait of the ramifications of the Mennonite practice of pacifism. I think a peaceful stance toward war is in style right now, but we often don't realize how true pacificism extents into everyday life and even when it comes to defending one's children, home, or honour. This novel draws out that theme and many others in its haunting, moving tale. In The Russländer, Birdsell focuses on a few years in the life of a single character. Nearly the entire novel is devoted to the youth of Katherine (Katya) Vogt, a Mennonite girl who grows up in Russia in the tumultuous days of the First World War and the Russian Revolution.I know the book received strong acclaim.I am not convinced. I had a hard time getting through this book. I failed to get into it. The story is certainly of historical importance but there are too many characters without a appropriate introduction or apparent relevant role. Not a favorite. A friend gave me the book as my family roots are Mennonite. I am very torn by the book. I absolutely loved the historical chapters written by the narrator’s ancestors, but I absolutely hated the present day chapters about the narrator’s personal/family problems. They seemed self-indulgent & a waste of time to read. The topic is really interesting. However I found the first half really hard to read and quite slow paced. By the time that the main event happens, things move more quick and the book is easier to follow. But it took nearly 200 pages to get there. The service half was great. I thought this was a haunting book that has stayed with me for years. It taught me so much I could not imagine beforehand about "stuff in Russia" ... Evocative, spellbinding work: fiction that goes 'beyond'. I couldn't finish this book which is rare for me. It just lost my interest and the characters did not seem based in reality. Lots of characters to remember. Yet I enjoyed each personality we met. Difference geographic location also important to be exposed to. Imagine the darkest scenarios you can imagine, now multiply those by ten and you’ve got a pretty good idea of the living conditions in Russia during the first World War.Sandra Birdsall's story “The Russlander” is a profound novel focusing on the life of a small Russian girl during the first World War and the rebellion that followed shortly after. The storyline follows Katya and her father, the overseer in a mennonite community, as they adjust to live settling in the Canadian plains. Conflict arises within the mennonite community due to pressures from the rest of Canada and the anger felt by the Russian working class due to the large gaps in the social classes and the abuse of the poor by the rich. Though there are numerous names and interactions to remember and keep straight, Sandra’s attention to detail makes for a powerful and moving story. But it’s this vast amount of information necessary to understand the story and the mature nature of the story itself that restrict it’s audience to those who are more matured. The story, though information fulled, makes you feel that you yourself are a settler in Canada dealing with a large number of angry working class Russians and pressure from outside the community, and because of this the book is near impossible to put down.Sandra has a way of writing which ensures that not a single word is there without a purpose, and because of this has created a timeless piece that I would recomend to anyone. I read this book just after The Road. I was on holiday, and my husband was pleading with me to get ready, everyone was waiting for us in the lobby, but I just couldn't put the book down and had to finish it before supper! It starts off with meandering memories of a girl and her Mennonite family in Russia, and the community there. There are tensions between her father and the rich Mennonite family that owns the land. But when the Russian revolution starts, life becomes incredibly frightening. It is not what the soldiers do on a field that makes war so evil, it is what your neighbour does to his neighbour when law and order break down. This was one of those books that started out SO SLOWLY that I almost stopped reading it a couple times. You have to have some knowledge or at least care a little bit about the Russian Revolution to understand the historical context (I had neither). But once I got into the story and really started to care about the characters, I couldn't put it down. The story of both having and losing family love and romantic love, as well as some of the beautiful backdrops was a huge suprise to come out of a book I got for $3 from a publisher's clearing house type store. Loved it! I've been wanting to read this novel for a long time. It deals with the daily lives of a Mennonite family in Russia just before the revolution after which their whole world changes and they must now deal with much suffering and ultimately severe brutality at the hands of anarchists & Bolsheviks. My grandparents were Mennonites who emigrated from Russia during the early 1920's and I wanted to get a better sense of how they lived, what they had to deal with and why they eventually decided to come to Canada. Excellent read. This is Russia through the time of the revolution and First World War, focussing on the plight of the Mennonites, as they became the enemy of all, having lost the protection of the tsar. This was when and where my mother grew up and came to Canada in 1923, so for me this was particularly poignant and I felt I had been given some greater insight into my mom's life. How I wish I has asker her more while she was alive, although her time before immigrating was so painful that she rarely spoke about it. Outstanding historic fiction! Birdsell's story of German Mennonites in what was then Russia (now Ukraine) prior to WWI told by an old woman in Canada. Katherine Vogt Heinrichs tells the detail of her childhood that she has up until now avoided telling her children and grandchildren through the war and Revolution. Birdsell manages to capture the innocence of the young Katya and the pain, weariness and simple joy of the grandmother as she looks back after a full life in Canada. A semi-fictional account of what happened to many of the German Mennonites who stayed in Russia after the first wave of emigration in the 1870's. Initially about their comfortable lives, even their superiority, and then their treatment and hardships-the hell they endured- after the Revolution. Pretty stark in places. This a sad but moving story about a woman who survived the Russian Revolution when most of her family did not. It is often difficult to read, but told in a gentle way. A great sroty of great courage and the ability to move forward when the world seems to stop. Slow start (first 200 pages) but then it really explodes. Lots of history and insight into the Mennonite way of life. Writing is marvellously detailed. Memorable descriptions of nature. Sad story. Birdsell writes wonderful prose in this story of Katya, a Mennonite girl who escapes being slaughtered along with most of her other family during World War 1 in pre-communist Russia. I found this book started off rather slowly, but wound up being quite an interesting historical read. Has there been an ethnic group, religion or culture that has not faced indignity and injustice? This story recounts the horrors faced by Mennonites in Russia in a personal way. Made me wonder how it is that history continues to repeat itself, in one way or another, over and over and over again.